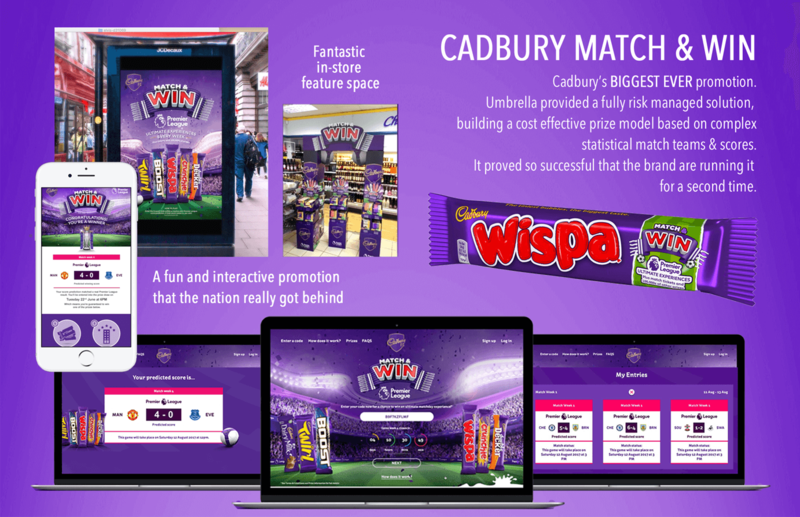 This standout on-pack promotion successfully leveraged Cadbury’s new partnership with the Premier League and offered consumers the chance to win the ultimate football experience via an innovative & engaging online promotional mechanic. Up for grabs were ten personalised Premier League match day experiences for two, 50 pairs of match tickets every week, 200 Premier League replica footballs and up to 200,000 free Cadbury singles bars. For a chance to win, consumers had to purchase a Premier League Cadbury pack then enter the code found inside the wrapper online at www.matchandwin.cadbury.co.uk. The code generated a predicted score for a fixture during that week (e.g Arsenal 2 – 0 Liverpool). Those whose predicted score matches the result of the specified fixture were put into prize draws to win prizes. Umbrella’s contribution towards this campaign won us GOLD at the IPM/COGS Awards. Services: Built a prize-model based on complex statistical match & team scores, managed back-end services, risk managed financial exposure.